Search key words using the search feature and easily find the information you need. The mission and focus of this website is to educate people about mini pigs. Our team is dedicated to protecting pigs, saving pigs, ensuring accurate and credible information is available about pigs and most importantly, helping mini pig parents with the sometimes complicated care of pigs. We have noticed a trend of positive outcomes with those we work with 1:1, so this proves that personal attention yields positive results. We will continue to help anyone who asks for our assistance because we all share the same love for pigs that you have. We have partnered with Just Answer, as an affiliate, in order to bring you answers NOW from a veterinarian. This is an online service that can be used in the event a mini pig family wants/needs to know more information about their pig's condition or whether or not a particular symptom warrants a trip to the vet. They are also experienced in mini pig behavior and can help answer questions about training and behavioral issues as well. The online veterinarian service can NOT prescribe medications or be your mini pig's day to day veterinarian, but they can give you safe advice in the event of an emergency or when your veterinarian is unavailable to answer questions you may have. Using this service, only vets with mini pig experience will respond to questions asked about mini pigs. There is a fee for the service, but there is a 100% money back guarantee. Let me reiterate, this does NOT take the place of your vet. We are always here to answer your questions as well, there is a ton of information on our website including emergency care, information about the health and care for your pig and yes, sections about training and behavior too. If there is something specific you want to know, you are welcome to use the search feature closer to the top of the page, but we want our website to be as helpful as possible to those of you who need that information right this second and Just Answer can do that for you. A "pop-up" box will appear shortly to give you the option to do just that. If you do not have any questions, feel free to simply close the box and continue using the website as usual. We just felt it was important that you have additional options available to you 24 hours a day, 7 days a week, 365 days a year. Thank you for being part of our mini pig family! Thank you so much for coming to our website to find more information about mini pigs. Please take some time to read over the content and don't hesitate to reach out to us if you aren't able to find the answers you're looking for. ​Where did your pig come from? Please click the best answer that describes your situation to record your response. It literally takes a few seconds to participate in this poll. If you have multiple pigs, once you answer, the results, up until the time you respond, will show up and if you don't mind refreshing the page, you can answer multiple times, preferably once for each pig. There's a glitch on the system that will not record multiple answers at once, but we will try to correct that before launching any other polls. We are trying to collect some information to put together more up-to-date data about pigs, particularly statistics; such as the rehoming rate. This is the first in a series of polls we will be creating to try and provide more accurate information that reflects the overall pig community as it is now. I believe some of the numbers in the past that have been quoted have been skewed, inaccurate, exaggerated or possibly even made up, so we decided to collect info from the pig community and put together the results in a format that people can see for themselves. These results will be accessible by anyone with internet access and ultimately has the potential to provide us with information that no one thought to collect in the past. The responses will be from the people in the pig community and this particular survey will give everyone a better idea of the rate at which pigs are actually being rehomed. But, this is how we are collecting the info that can be used to determine these systems that are clearly broken from a non-biased cross section of "pig people". Since we are in the process of cleaning up our website and reformatting the pages and layout, please excuse our mess as we do this. We want the information to be easily found & understood, therefore, we will be using a new design that may make the website more "user friendly". The website is available in many different languages using the Google Translate button in the top left corner. Not every page or phrase translates as intended, so please reach out to us directly if there is something you do not understand. There is also a search bar to help you quickly find the content you're looking for by searching for key words or use the table of contents button below. 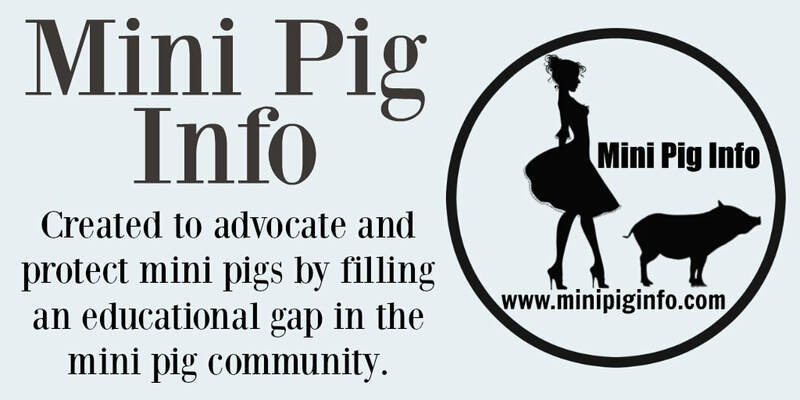 Please consider signing our ongoing petition to help families who are attempting to have city ordinances changed to allow mini pigs to live within city limits. It only takes a few seconds to sign and keep in mind, your signature could be life altering for someone who is fighting to keep their pig. The petition can be found by clicking the link below.